Only by using Cumin Seeds, you can reduce 10 Kgs of weight in less than 30 days. You are advised to check your weight periodically. The results may vary depending upon individuals life style. Since this research is already done on 88 women and they have seen 10 Kg weight reduction in 20 days, I thought, I should make this as a contest within Art of Self Treatment group. I am glad large number of people have come forward to contest. 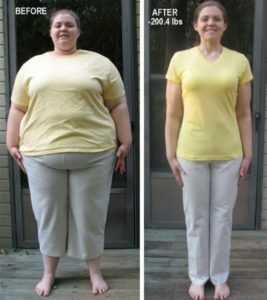 Suppose you are able to see a reduction of 10 Kgs within 20 days, you can stop the treatment. Please note, incase you don’t get to see the desired reduction in weight after 30 days (which is going to be a rare phenomena, don’t blame the system. You need to follow a healthy life style to get results). 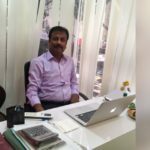 Just by using cumin seeds (jeeragam in Tamil, jeergey in Kannada and Jeera in Hindi) you can reduce your weight by 10 Kgs in less than 30 days time. 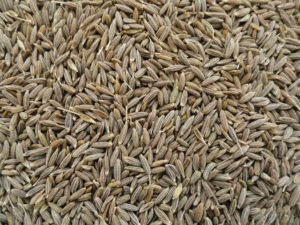 Cumin seeds are being used in our daily diet to give us some aura. 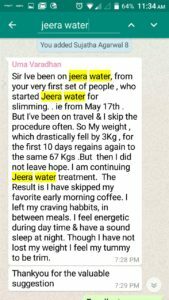 Are you aware that if it is used in a proper manner, if you are over weight, you can reduce 10 kgs in less than a month. There was a research done recently to check whether cumin seeds will help in reducing weight of a person if he/she is over weight. In this research 88 fat women were asked to try this treatment of consuming cumin seeds every day and it was found that the metabolism increased, fat got reduced, calories were automatically burnt. Apart from this, there were many other benefits too. To reduce weight, how should we start using the cumin seeds ? This question may be there in every one’s mind. If you quickly want to reduce 10-15 kgs weight, then follow the guidelines given below and use cumin seeds in this way only. Previous night soak 2 table spoons of cumin seeds in water. In the morning, boil the water then strain it, squeeze lemon into it and drink it for four weeks to reduce your weight. Add one tea spoon of cumin seeds powder into curd and have it every day for a period of 4 weeks. Add Cumin seeds powder in water along with one / two tea spoon of honey and drink the water every morning for 4 weeks. By doing so, the fat will get drained and you will come to normal weight. You can add one spoon cumin seeds powder in tomato soup and enjoy the soup every day for a period of 4 weeks. In the soup if you add lemon and ginger, it will be better. For this, carrot and any other vegetable you like may be baked and eat it. In that vegetable, grate the ginger into it, then squeeze the lemon plus cumin seeds powder. Eat during night time and you can see your bulging tummy getting reduced very soon. Cumin seeds kills fat and burns calories since it increases the body’s metabolism. Like this if you add Cumin seeds in your daily diet you can surely reduce your weight very fast. There will be no heart attacks. 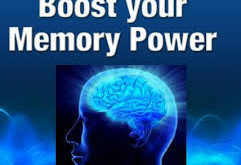 For memory loss people, this will help in increasing the memory. Corrects the blood level and haemoglobin level. Arrests Gas problems and many more. 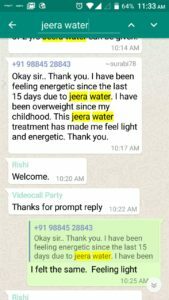 After going through this tamil article posted by Lakshmi in the Art of Self Treatment Whatsapp group, I thought of testing this out with about 10 fat people to see how it works. Incase it doesn’t work, even then, there is no harm in this treatment as it will not harm any one. 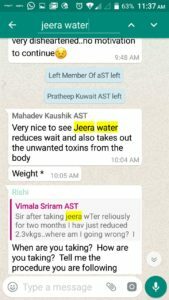 After this post by Lakshmi, I also did independent research, consulted Healer Baskar also to find out whether this will work. The answer was positive. There is only one apprehension about the number of days mentioned. 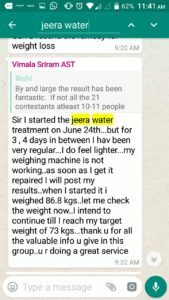 For a person who is weighing 130 Kgs as against 70 or 75 Kgs normal weight, reduction of 10 Kgs is not going to show at all. Such people can extend the treatment to may be 3-6 months to become normal. It’s fairly a good number. All these 21 people have to commence this treatment from Wednesday, 17th May 2017 onwards. Since soaking of seeds will have to be done in the morning, you have the full day for yourself to buy adequate Cumin Seeds and stock it at home. After you have purchased the seeds, pour all of them on a newspaper and remove unwanted dust, stones if any. Take some pains in segregating the same. You should expose the seeds for atleast 30 minutes to sunlight. No need to keep it under the sun for the whole day. 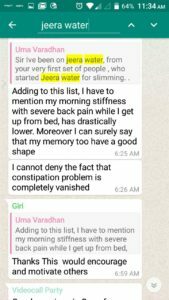 On 17th June 2017, each one of them should check their weight and post it in Whatsapp group. People who are having bad habits such as Smoking, Alocohol need not follow this. It will not work for them. This will work for people who are leading a disciplined life. I don’t advise you to stop eating. You are free to eat whatever you feel like, but eat it properly. How to eat properly ? 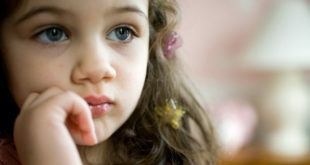 Out of 3 times of food that you are having, atleast once a day, chew food 32 times, close your lips and munch like a cow, convert the solid food into saliva and drink. Remember this. Drink food and eat water. Don’t drink water half an hour before and after food. Drink water only when you feel thirsty. Sip the water as if you are drinking hot coffee or tea. Use Sesame oil, Coconut oil or mustard oil while cooking. Do not use any branded refined oil. Comfortably eat bajji and bonda whenever you feel like. You can have oil as side dish. Dip Bajji and bonda in oil and eat it. Absolutely fine. Do not use Olive oil. For Indians Olive oil is not suitable. Have faith in Art of Self Treatment. Wishing all the contestants very best results. People who are reading this article for the first time may not have any clue what this is all about. Just whatsapp me on 8553015850 with your name, age, location and I will add you one of the Whatsapp group. Next Why “3 x 1/2 minute” is very important?